Kalvarija, presently a small city in the District of Marionpole, Lithuania , was built in the 17th century on the site of the small village Trabi on both sides of the river Sheshupe. By 1678 King August II recognized it as a city and gave it city rights. From the years 1795-1807 the city was part of Prussia. 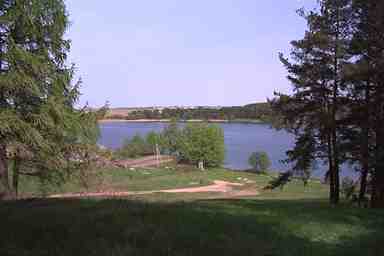 In 1815 it was conquered by the Russians and was included in the Gubernia of Suwalk. Kalvarija's fast development was mainly due to the fact that it was along side of the road to St. Petersburg and Warsaw. By 1827 there were 501 buildings, in 1867 it became central city of the district which included a courthouse, post office, telegraph agent, a hospital of 25 beds and 3 doctors.There was also army doctors in the 2 army units in the barracks there. Kalvarija had a large jail, several factories for the production of medicinal alcohol, and a large market. Russian control continued to 1915. During WW2 the Germans overthrew the city and surrounding areas. 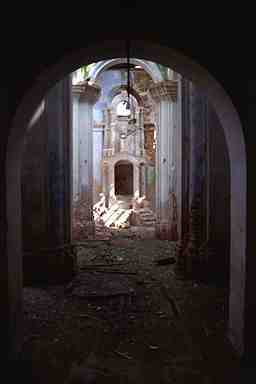 Half of the city was burnt around 900 buildings. In 1919, with the evacuation of the Germans, Kalvarija became part of the District of Marionpole in independent Lithuania. In 1921 Kalvarija was connected to the Lithuanian railroad. In 1926 a hospital, 500 beds, for the mentally ill was moved into what where once the army barracks. It was one of largest of Lithuanian medical institutions. During WW2 many buildings were destroyed. There is a good possibility that there was a Jewish presence in the village of Trabi that was in the weaving trade. As early as 1713 the Jews received permission from King August II to build a synagogue under the condition that it would not be higher than the church. Jewish craftsmen also received permission to work without becoming members of the guilds. Jews were mainly engaged in trade, crafts, and agriculture and in a small part industry. Jews owned more then 80% of the stores (60 of 72). Grain trade was also in the hands of Jewish merchants exporting mainly to Germany. There was also a pig's bristles processing factory for brushes where many Jews were employed. The workers of this factory organized, under the influence of the "Bund" during the years 1893-1897. They organized strikes in order to improve their working conditions to just 10 hours a day, and to improve their salary which was at a starvation level. The achievements of the German Jewish community in the areas of Science and culture made a big impression on the Jewish community of Kalvarija and several of the sons of the rich began to study, along with their religious studies, Russian and German. They "Germanized" their Yiddish, which was known as "Kalvaricha Deuth", which was well known in Lithuania. The German example (culture) on one hand, and the poverty on the other hand where led to the emigration of many. Hundreds of the young and young families left the city in the 80's of the 19th century, mainly to the U S, South Africa and Eretz Israel. In Kalvarija there were several "specialists " who made their living by smuggling emigrants through Germany, as this was cheaper and less complicated. Most of the Jewish children studied in the "Heder", in a few of these Hebrew and grammar were taught as well. There was also an institution for 150 poor children for the study of Talmud-Torah. 1858-59 with the permission of the local authorities a general school was created where 80 - 100 young boys and girls studied. Many continued their studies in the Russian Gymnasium in Suwalk or Marionpole. In 1871 15 Kalvarija youth studied in these institutions. In 1899 a school for the poor was formed by some of the richer families to enable them to continue studies after the "Heder". In 1803 a new synagogue was built with heavy walls of large stones. The Bima and Tora case was decorated by an artisan and the walls were also decorated by paintings of animals. In the courtyard a Beit Midrash was built. Social work in Kalvarija. Active charity organizations (Gimilot Hasidim) gave loans with small weekly return payments. A sick charity ( Bikor Cholim) gave health services and medicines and a group of women and young girls gave aid to the sick. By the end of the 19th century many were learned in Hebrew and subscribed to the Hebrew press Hamalitz,Hamagid and Hasharchar. There is early evidence to aliaya to Eretz Israel as there are 9 tombstones of former Kalvarijian residents on Mt Olive cemetery in Jerusalem.In the early 80's youth joined the "Yesod Hamala" organization with the purpose of Aliya to Eretz Israel. In 1890 the Zionist movement Hovavei Zion gathered signatures to send protest to Baron Hirsh in order to convince him to help resettling Eretz Israel instead of Argentina. In 1894 the organization " Shcarei Toushia " was formed in order to educate toward Aliya. In a donor list for Eretz Israel , in 1909, 120 names from Kalvarija residents. Autumn 1914 with the beginning of W.W.I Jews were ordered to hard labor on roads as punishment for their German support. In the battles in the area in and around Kalvarija there were 220 casualties to the Jewish community. Half the city was burnt including the old wooden synagogue. Most of the Jewish residents were forced to leave their homes and scattered to other towns in Russia. At the end of the German occupation many returned and were in the need of aid. With the formation of Independent Lithuania on the 16th February 1918 and the evacuation of the German army at the beginning of 1919, many of the former resident began to return. With the announcement of Jewish Autonomy an 11 man committee was formed. This committee was active in most of the Jewish life during the years 1921-25. Since most knew Hebrew as well as Yiddish the protocols were written in both languages page opposite page. In the local council there was also representation from the Jewish community. In the election of 1924 a Jew was elected as Vice Mayor. In 1934 there were three Jews in the council of nine. The Jewish community began to rebuild their houses that were destroyed and many returned to their former occupations. The economic situation was bad and the store owners suffered most. Grain trade also suffered because of the new laws limiting trade. The situation was so bad that in 1923 a committee sent a letter to the main national Jewish committee with requests for aid for 97 men women and children (listed by name) that need clothing. From a survey conducted by the Lithuanian government in 1931 there were 72 stores in Kalvarija 60 of which were owned by Jews. On that same survey there were 16 factories and small crafts shops in the hands of Jews. In 1937 there were only 32 in the hands of Jews. 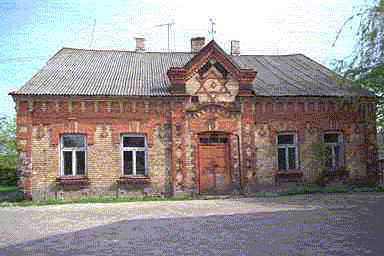 The psychiatric hospital, the largest in Lithuania, offered livelihood to Jewish contractors and suppliers. The scenery and pure air that surrounded the city, the river Sheshupe and the forests beside it drew many Jewish vacationers, which also added to the resident's livelihood. The Lithuanian Organization of Merchants was against buying from Jews and as a result there was a boycott against Jewish stores and craftsmen. The Lithuanian co-operative took in their hands the agriculture industry exports and the imports of agricultural tools, seeds, fertilizers etc. and in this many lost their livelihood. In 1939 the National Lithuanian Party in Kalvarija proclaimed that the market day be on the "Shabbat" (Saturday). These were the main causes of emigration. In the Jewish school Yavne there were 135 students, in the Yiddish school 130 students. There was a high school of eight classes. This institution was in operation till 1935 and was closed because of lack of students. A Hebrew kindergarten was active, a library of 2000 books in Hebrew and Yiddish. From time to time theatre groups would come to Kalvarija to perform and the local residents also had amateur performances with the income for Keren Ha Kayemeth, Keren Ha Yesod, Wizo and Keren Tel Chai. Zionist groups were active in Kalvarija. There was a Kibbutz run by "Ha Halutz" for preparing youth for their aliya. The youth received Zionist education in the Hebrew schools and the youth movements and many did reach Eretz Israel. Sport activity was centered mainly in the local branch of "Maccabi". There were also volunteers in the local fire brigade. One member received an award in 1937. In 1939 the Germans deported 2,400 Jews from the Suwalk province of Poland to the border of Lithuania and 800 of these were absorbed and taken care of by the residents of Kalvarija. When Lithuania became part of the Soviet republic in June 1940 factories in the hands of Jews were taken over and put in the hands of Komisars. Supplies were limited and prices rose. The middle class which was mostly Jewish was the hardest hit. Jewish youth movements were abolished and the Communist youth movement made great efforts in enlisting youth. Hebrew educational institutes were closed. On 22 June 1941, the first day of the war between Germany and Soviet Russia, the Germans entered Kalvarija. On the 1st of July the Lithuanian police proclaimed that all Jews were obligated to wear the Yellow Star patch, and that they were forbidden to walk on the sidewalks. Jews were taken to work at hard labor and on the way to work and back they were humiliated while the Lithuanian population watched. At the beginning of July 90 people, Lithuanian communists, Jewish intellectuals, and others were brought in to the hotel"Zdarouvitz". There they were beaten, tortured for several days.On the 5th of July they were brought to the banks of lake Orios, about 2 km from the city, where they were shot and buried. On Shabbat 30th of August all the remaining Jews where evacuated to the barracks in Marionpole, under the pretense of being sent to the ghetto there. All their belongings where left at the Synagogue and in their empty carts the Jews were transported. All in all there were 8600 Jews in the Barracks. On 1st of Sept. 1941 they were all brought to the banks of river Sheshupe and there near pre dug pits they were shot and buried. The Lithuanian police and shot later caught some that managed to escape. After they had rid themselves of the Jews the locals, at the head the Priest proceeded in destroying all the Jewish shops that were in the vicinity of the church and with their bricks built a wall around it. During WW2 1/2 the city was destroyed. Nothing was left of the old Jewish cemetery. Beit Ha Midrash remained whole is used as a granary. After the war only one Jewish family returned and lived in their home for about 1/2 yr. In the years 1989-70 there was but one Jew living in Kalvarija. In the 1990's the old cemetery was partially restored. In the 19th century Kalvarija was part of The Kingdom of Poland in Suwalk Gebernia. In the process of researching for this page I made contact with many other Kalvarija researchers and have made a list of their surnames. The name Preis may have come from the time that Kalvarija was part of Prussia between the years 1795-1804.
their local collaborators killed in a gruesome fashion. as the Jews of Marionpole I suggest a visit to Marionpole shtetle page on Shtetlinks. Mariampole, Lithuania: the translation of the necrology from "Mariampole al gedot ha-nahar Sheshupe"
has been contributed by James M. Friedlander. A widely-used searchable database which connects people who are searching the same ancestral towns and surnames. "This page is hosted by JewishGen, Inc., the Official Home of Jewish Genealogy, at no cost to the public. If you have found this page useful, your Jewish Gen-erosity is greatly appreciated. "Donations to JewishGen are tax-deductible.